adidas's marketing pitch: Designed for racing and fast training. 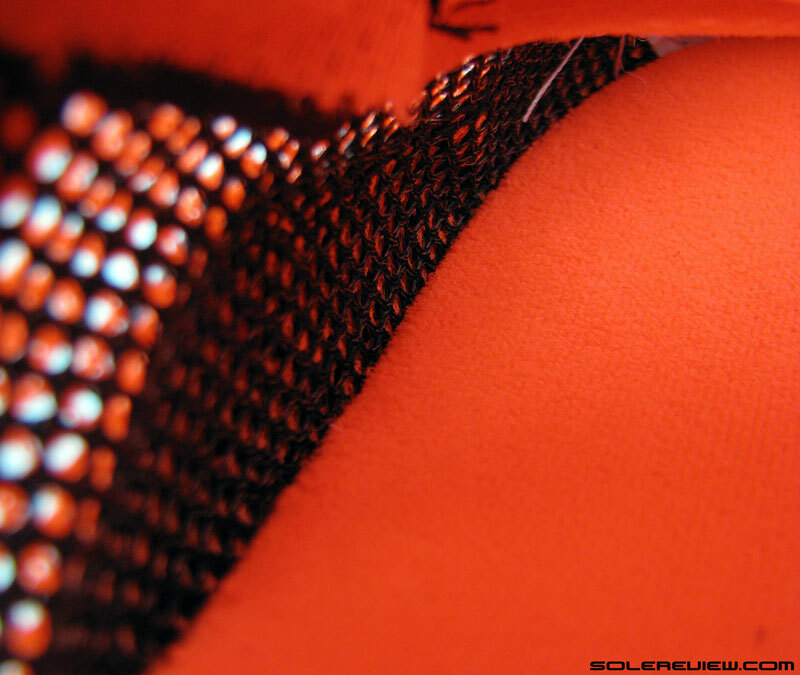 Surfaces tested on: Road, track, ambient temperature of 22° C/72° F.
Upper: Unlined spacer mesh, synthetic leather. 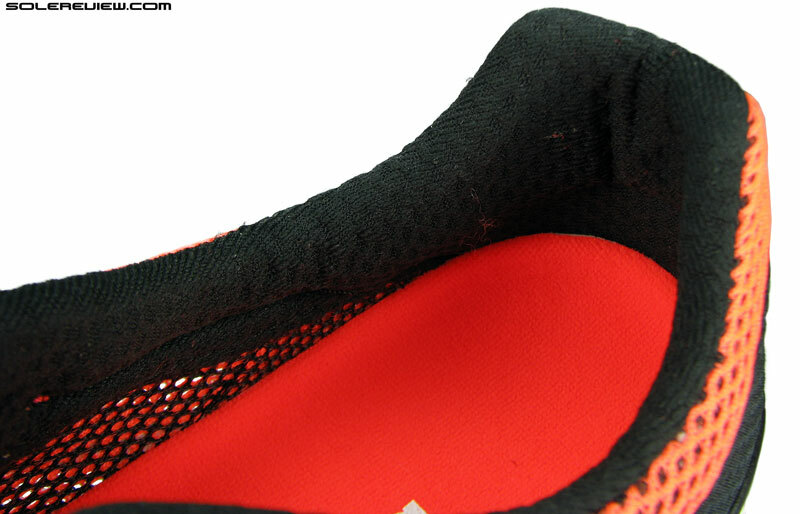 Midsole: Responsive Boost foam topped with an EVA rim, plastic midfoot shank. 9 mm heel drop. 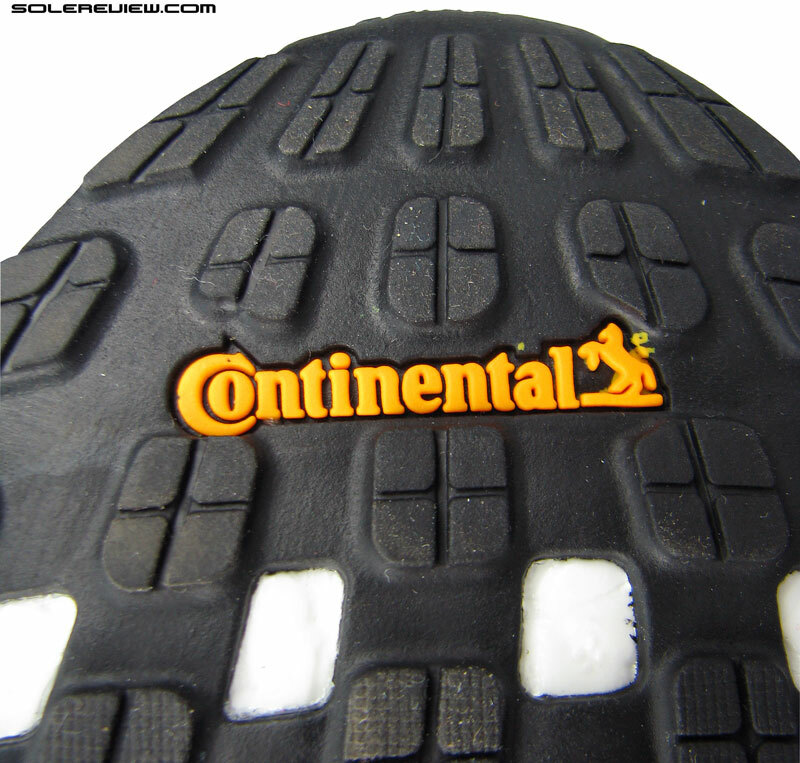 Outsole: Continental rubber under the forefoot, adiwear under heel. adidas should start putting model numbers (V1, v2) on their shoes. Really. adidas’s line of racing flats and semi-flat speedsters has been around for a while, commonly known with the adizero prefix. A close equivalent of this assortment would be New Balance’s 1400/1500/1600 series, which have shoes with varying degrees of racing/competition purism. 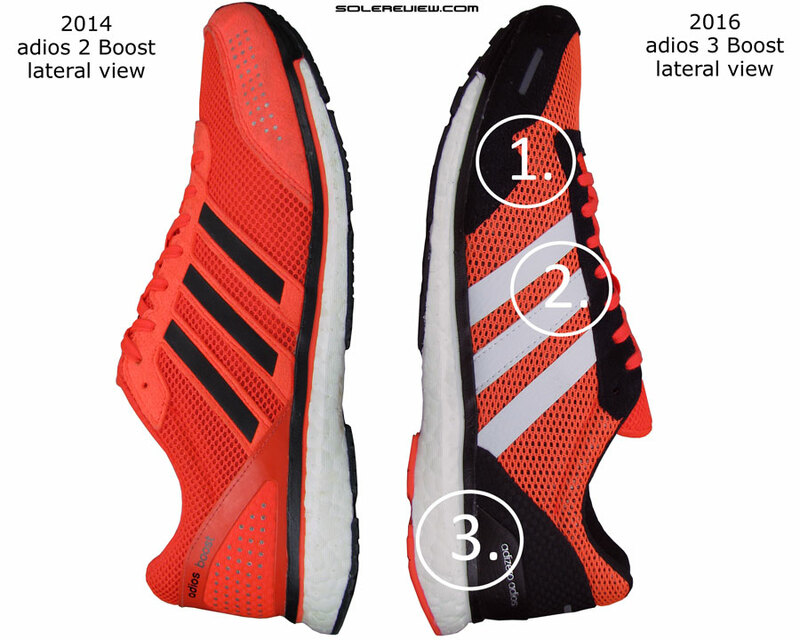 The adios 3 Boost isn’t a racing flat per se, but a level below. It’s got decent levels of heel padding (27 mm stack) and lift, resulting in a 9 mm heel to toe gradient. If you’re looking for a true adidas flat, then consider the Takumi Sen 3 Boost (and Ren) – shoes which were originally meant for the Japanese market and later introduced in select international territories. It’s a well known fact that Japan is racing flat heaven, and many brands sell Japan specific shoe models not found elsewhere. The adios is a quasi-flat, combining a low profile silhouette with adequate cushioning. adidas markets the adios as a racing+fast training shoe, and the shoe’s precisely that. 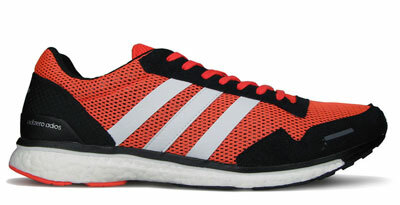 The adios 3 is 246 gms/8.7 Oz for a US 11 which is lightweight enough and yet has decent levels of cushioning underneath. The previous generation adios 2 was the shoe of choice for adidas sponsored elites, so you were likely to see that model commonly crossing marathon finish lines. While the adios 3’s Boost cushioning sets it apart from true flats, conversely some runners might find the cushioning lacking for marathon distances. Though there’s enough cushioning to go around, the upper is typical racing flat – lightweight, with a deconstructed form factor. Not everyone might find the adios 3 cushioned enough for a full marathon, so to be on the safer side, we’d say that the adios is perfect for anything between a 5k and a half. Works for daily training too, though that is increasingly becoming a concern due to adidas’s use of lower lasting rubber compound. You would also want to consider other model with shades of the adios – the Boston, which is a more built up version of the adios, and the Tempo Boost, which is a basically a Boston Boost with medial side support. Another way to see the Tempo Boost is to do so as a lighter, speedier version of the Sequence Boost. And if you were looking for an adios type profile and weight class, but with a firmer ride, then the regular non-Boost Adizero adios is the shoe for you. After all, the adios 3 being reviewed is basically the adios with a Boost midsole – at least conceptually. The EVA based adios is available for a lower MSRP than the Boost model, and you’ll get the race specific ‘Quickstrike’ forefoot. 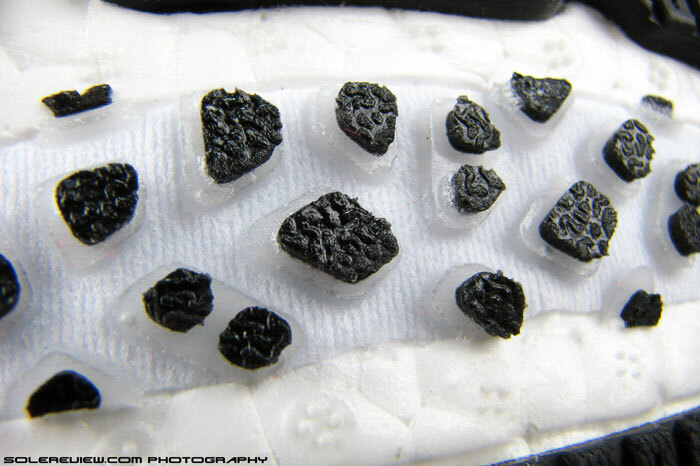 adidas Quickstrike is this construction approach which ‘stencils’ pieces of molten rubber on a fabric base. This design helps the shoe shed weight while providing flexibility and reasonable levels of durability. DSP is usually found on higher end raceday shoes and flats; in adidas’s current assortment, the EVA based adios and both the Takumi twins have them. 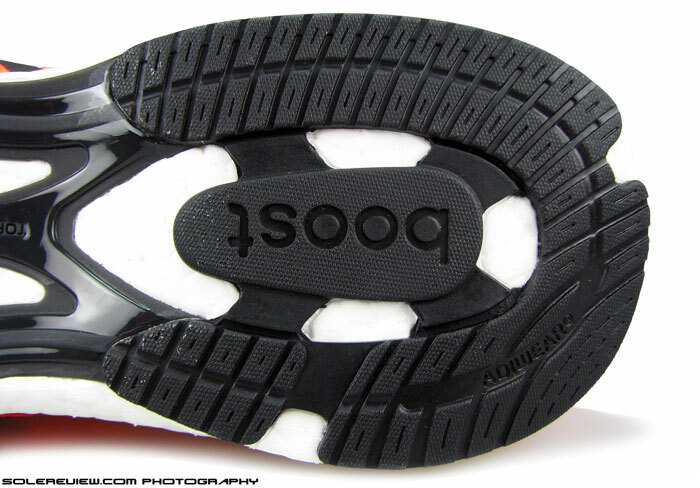 The adios 3 ditches the dual stenciled forefoot seen on the adios 2, and plugs in a regular sheet instead. 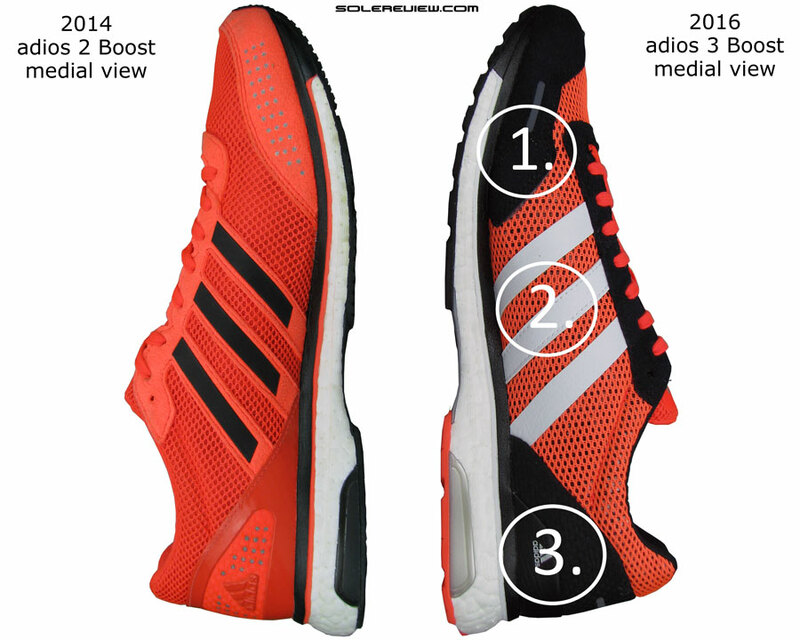 The 2016 adios Boost does not have the quick-strike forefoot, however. It now features a regular rubber outsole which covers the entire forefoot. There’s a bright side to this, and a couple of drawbacks. 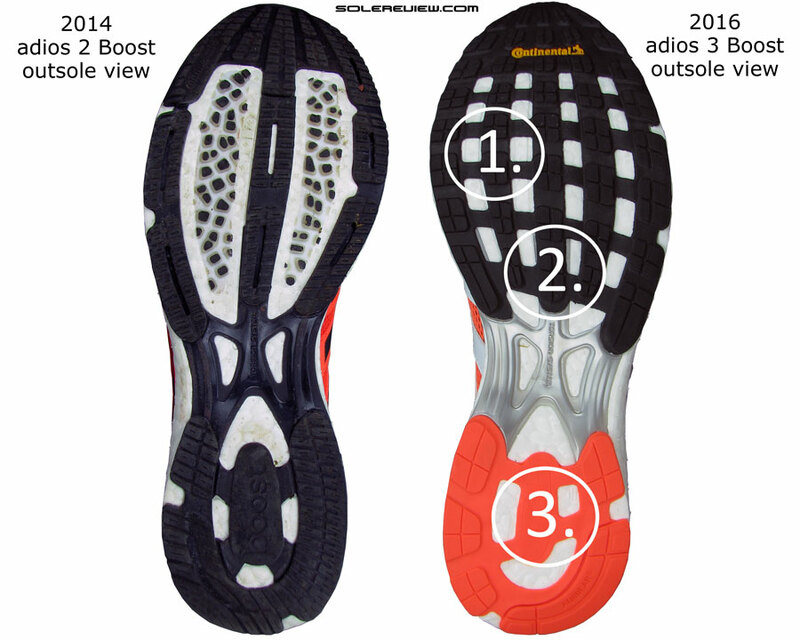 On the 2014 adios 2, the forefoot outsole had a narrow rubber strip running down the center. The DSP panels flanked either sides of the strip, and the plastic Torsion shank extended below the rubber strip. The point being, there was a lot of material (rubber+plastic) concentrated right down the middle while the sides were relatively soft and exposed. 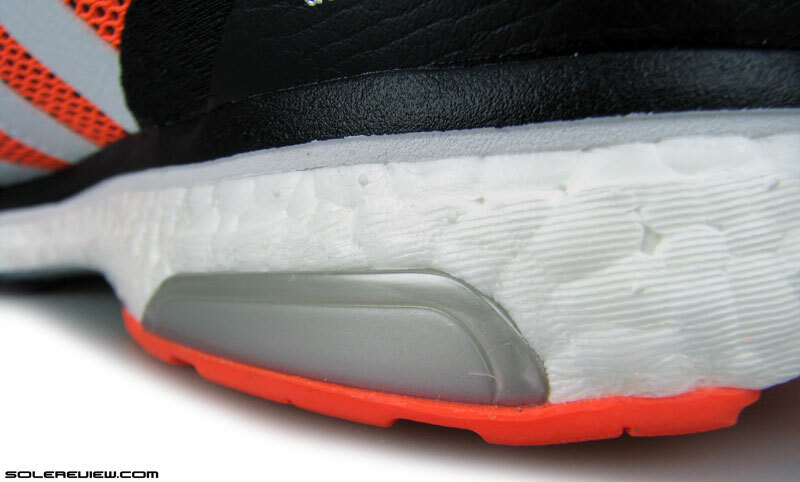 During runs, you could feel the adios 2’s center strip as a separate component in relation to the softer edges. 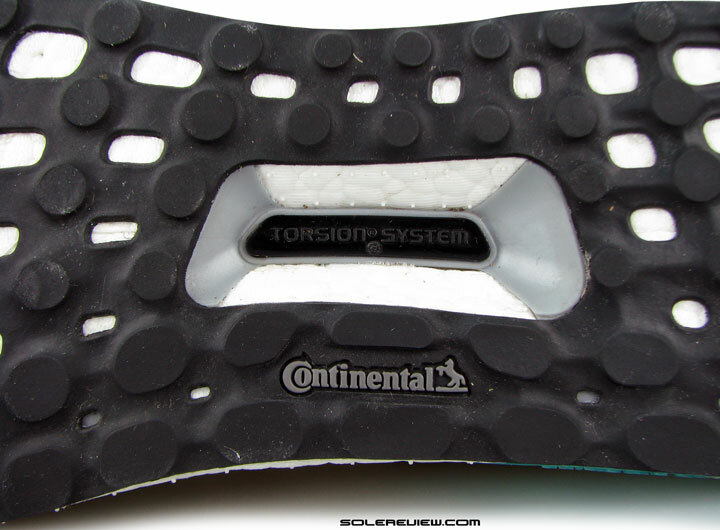 With the adios 3 moving to a full rubber forefoot, material is now spread evenly across the surface. This eliminates the strip-like feeling experienced on the adios 2, making the forefoot feel more uniform and less lumpy. That was the bright side. 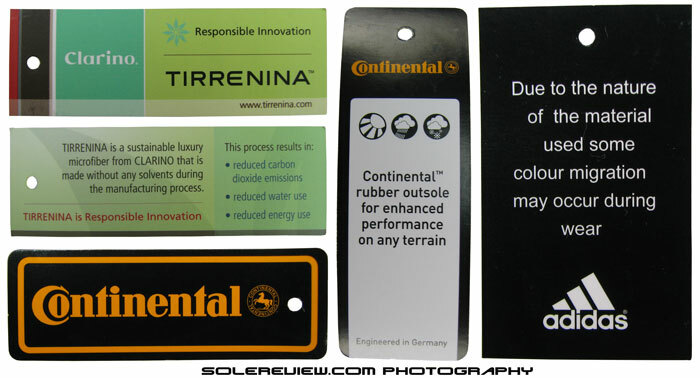 A Continental branding does not necessarily equate into rock solid durability. This softer version provides grip, but comes with durability as a trade-off. This new design does come with its negatives. 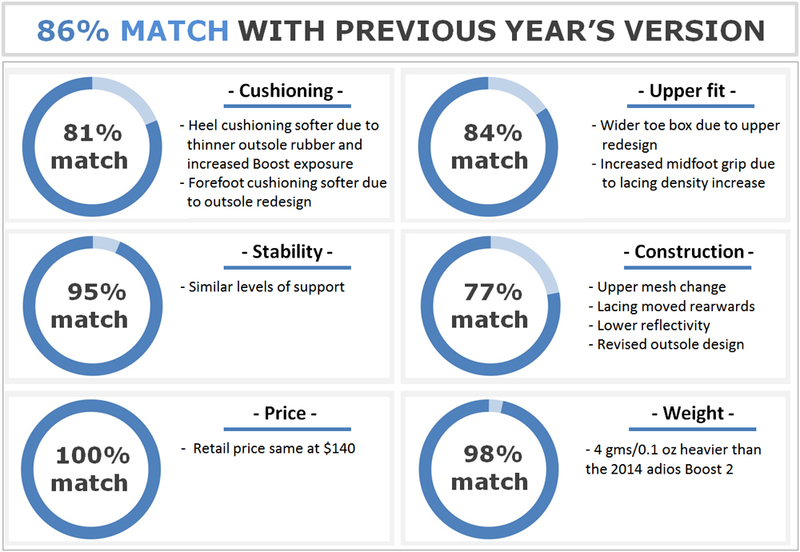 Of late, adidas is trading outsole durability for softness and traction (the grip quality has dropped on the adios 3 though). 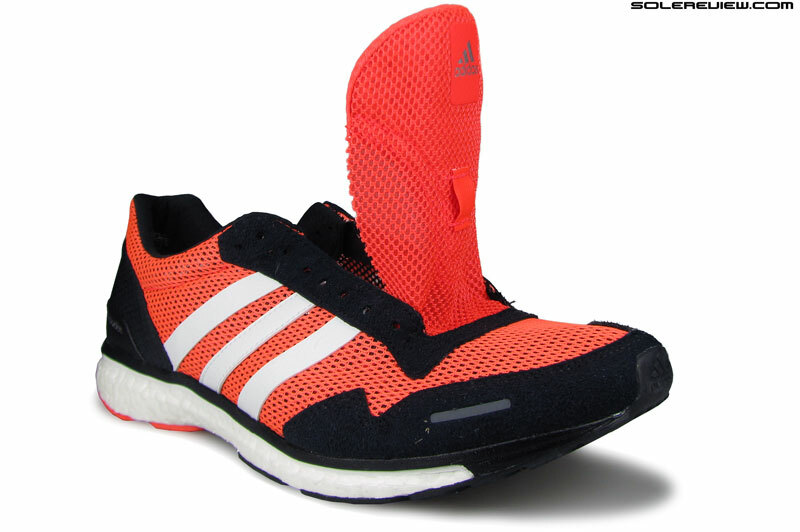 Which means enhanced cushioning feel of the Boost foam, but with lower mileage. Durability started going downhill with the original Ultra Boost, a shoe with a rubber compound so delicate that its pointy nubs were reduced to a flat landscape in 40 miles flat. The Ultra Boost ST followed with its softer Continental outsole rubber. 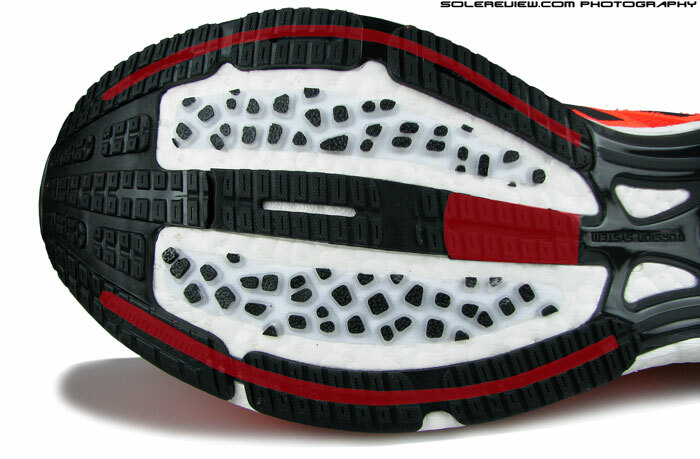 The nubs came ‘pre-flattened’ , a design which got picked up by later versions of the non-ST Ultra Boost as well. And then there’s the latest news. Multiple readers have reported that adidas made a mid year update on its Glide 8 Boost, switching its ultra durable Continental rubber outsole with a faster-to-shred variety. We checked it up on a retailer’s website, and that indeed appears to be the case. Way to ruin a great shoe, adidas. That ill conceived design approach has been adopted on the adios 3 as well. 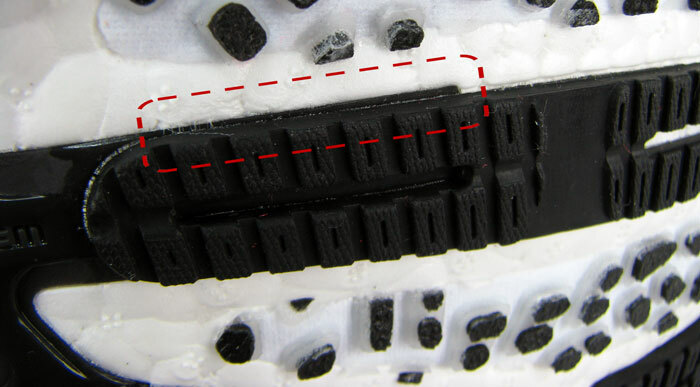 We noticed a LOT more initial wear on the adios 3’s outsole than we did on the adios 2, and this is indicative of the faster wearing rubber material used on the latest adios. That’s negative #1. The second negative is that the forefoot grip isn’t as great as the adios 2. One of DSP’s strengths is its high level of grip, so taking the rubber embedded fabric out results in a corresponding drop in traction levels. The adios 2’s DSP also made the shoe a great track training tool; this is now an area where the 2016 adios 3 feels less assuring when curve sprinting on your local 200 or 400 meter tracks. 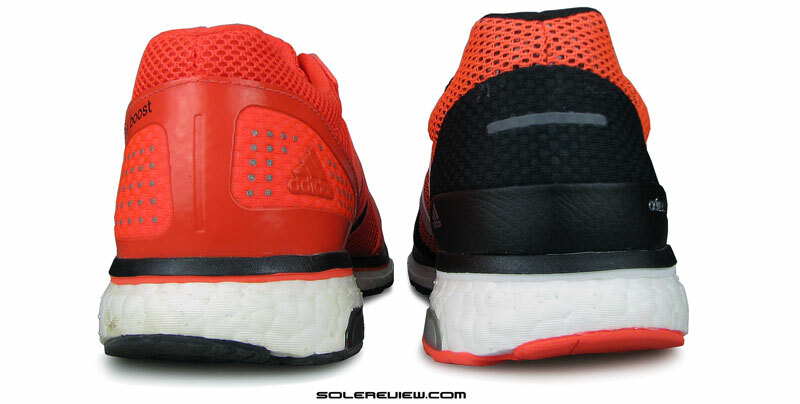 1) No more DSP Quickstrike, there is a softer rubber sheet instead 2) The midfoot pressure feels more evenly spread 3) Softer and thinner heel outsole, plus larger exposed Boost foam area. Adios 3’s switch is not just about a softer rubber, but a thinner one in certain areas. The part right under the heel, for example. 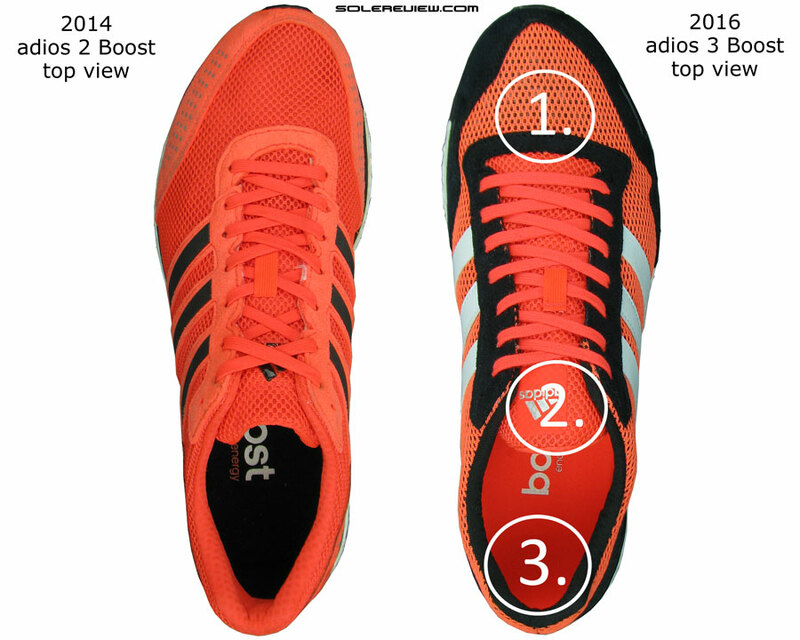 This is the place where it says ‘Boost’ on the adios 2. (see picture above). 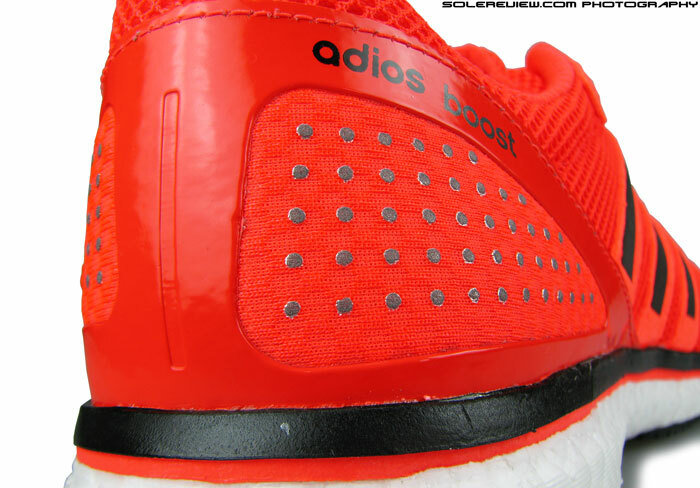 The adios 3 gets rid of the Boost callout, and in its place puts a thinner+softer rubber which also opens up a large area of exposed Boost foam. 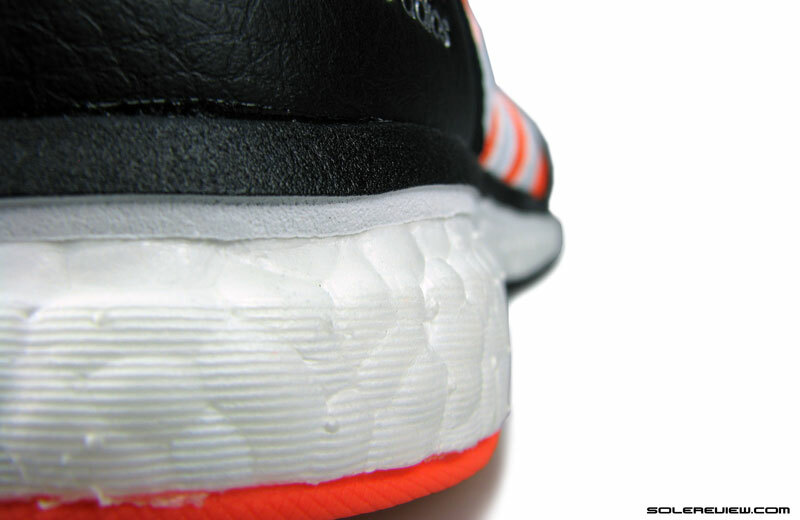 Thinner outsole rubber+exposed Boost = softer ride. So both these changes – soft and thin – makes the adios 3 ride softer than the adios 2. The difference in softness is more pronounced under the heel than it is under the front. The thinner heel rubber yields more easily than the harder adios 2 material, and the exposed Boost area heightens the cushioning experience. Hence, while previous version of adios rewarded you with responsive cushioning with higher speed, the adios 3 makes it relatively cushy from standstill. 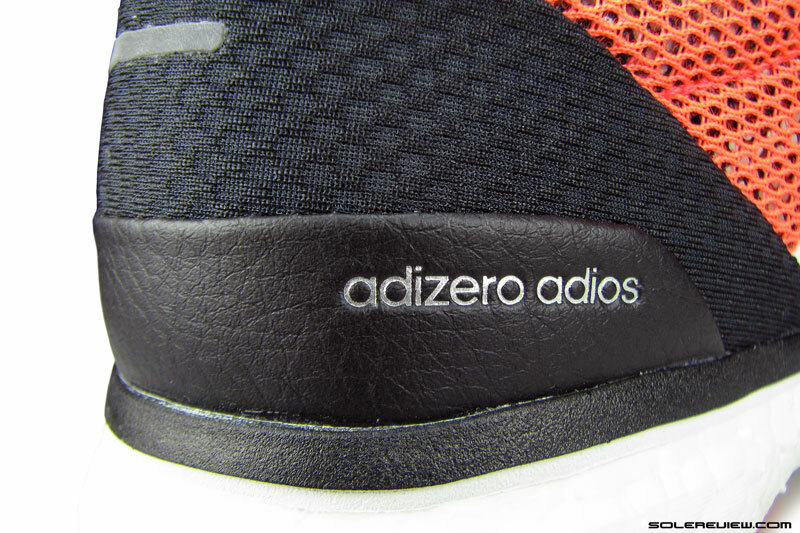 Though you have to ask – was it necessary to make the adios 3 a softer shoe than the adios 2? The answer (and the choice) depends on who’s asking. Personally, we preferred the firmer ride of the adios 2, because the adios 3 lacks the snappy feel of the last generation model which made the shoe feel relatively fast. Except for the outsole, the midsole design hasn’t changed. Which means that the adios 3 retains a lot of what made the adios 2’s underpinnings. …which extends on the medial heel side to form a supportive prop. The Boost midsole still rides great nonetheless. It delivers an evenly spread transition feel one expects from a full length Boost midsole, and the ride is supportive as well. The heel edge is beveled to ease rearfoot landings, and the medial side midsole has a plastic levee of sorts which functions as a support feature. 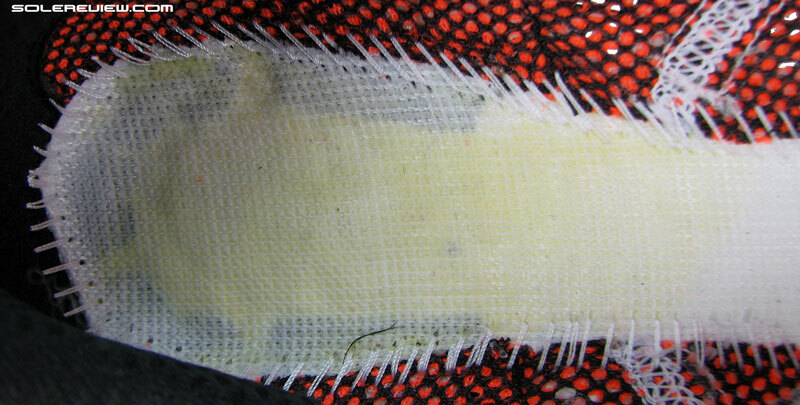 The insole is carried over from 2014. Soft fabric topping and all that. We first saw this design on the 2008 adizero CS. So yes, it’s been around for a while. 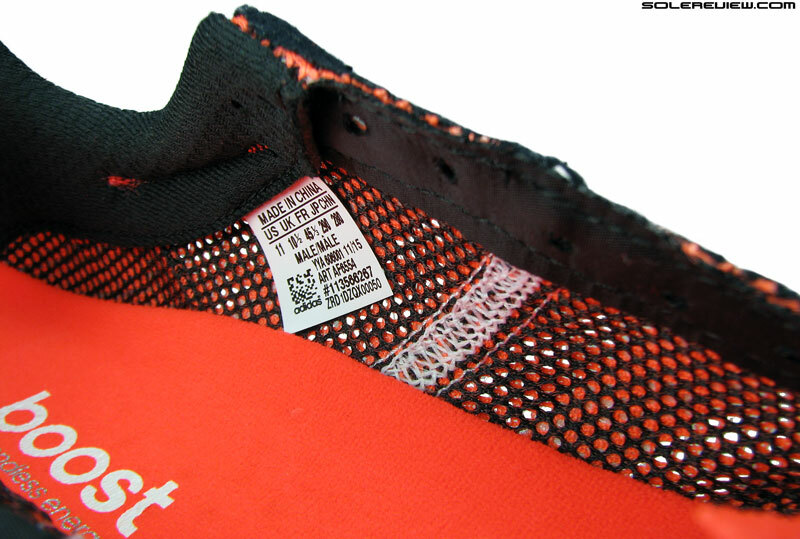 The lasting fabric connects to the Boost midsole directly. No EVA business here, except on the edges. A circular cut-out over the forefoot helps augment the cushioning feel. 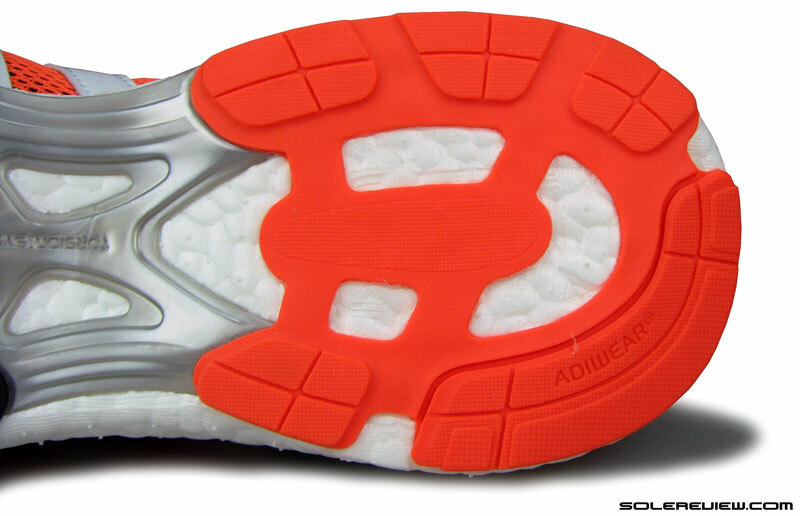 Most midsole features have been retained on the adios 3. 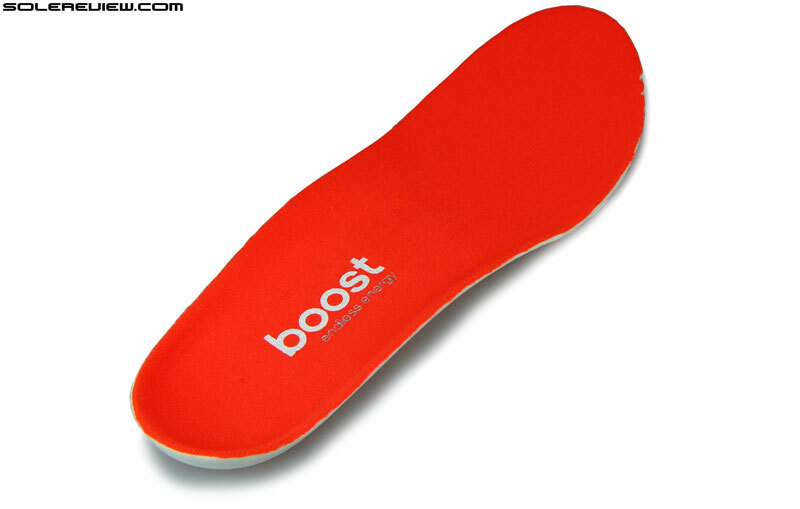 The insole used is the same old, and an exposed forefoot lasting enhances ground feel by making the Boost foam easier to access. 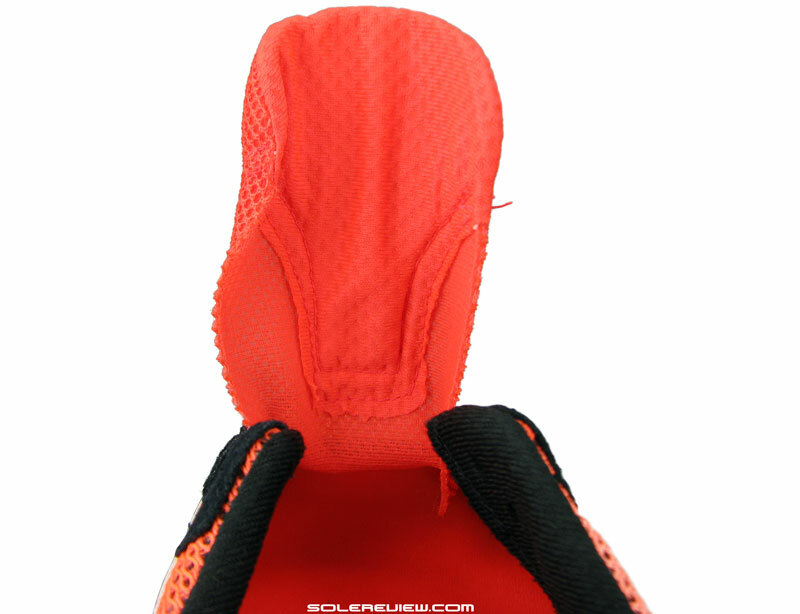 Over the heel, only a thin sheet of fabric covers the midsole – this also helps increase cushioning responsiveness. It was a bit surprising that the adios 3 hasn’t put on any additional weight, given the fact that there’s more rubber under the forefoot. 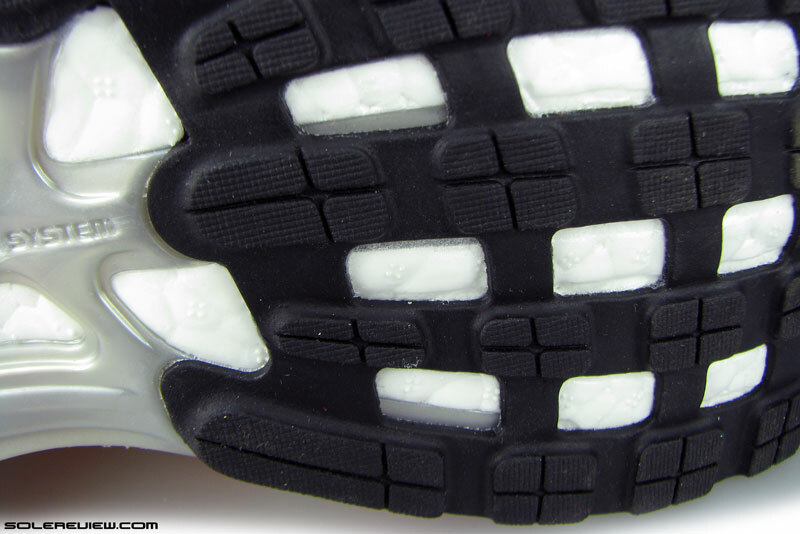 It is possible that the thinner variety of outsole rubber makes up for the (perceived) weight gain achieved by extra coverage under the forefoot. It certainly seems that way, because the adios 3’s upper should be of the same weight. The adios 3 upper is a major facelift. The adios 2 upper design had a deconstructed nature with an unlined outer and tongue mesh, with the intention of minimizing weight. This year the upper is even more so, giving the adios 3 a retro racer aesthetic. There is an improvement with respect to upper fit, but at the same time some of the elements seen on the adios 2 has been stripped off, making the adios 3 look comparatively bare-bones. Before getting into the details, some critique of adidas’s finishing quality is justified. The German brand’s level of footwear assembly quality has to be one of the worst; and from what we’ve seen, Brooks gives adidas company. This pair of adios 3 was bought at a Vancouver (CA) store earlier this year. The first pair pulled out of the stockroom had such a shoddy kind of finishing, it did not deserve to be sold at full price. There were adhesive marks all over, and the components were misaligned in their fitting. The left shoe was different from the right, the kind of thing which actually results in different left and right upper fits. Solereview had to inspect three different adios V3 pairs, and finally ended up mixing and matching better finished US 11 half pairs. This isn’t the first time we’ve seen such bad manufacturing; our Tempo Boost review demonstrated adidas’s lackadaisical approach towards making their $100+ shoes. So don’t be surprised if the fit on your adios 3 pair seems somewhat off; that’s adidas’s quality control working its charm. Anyway – the luxury of buying the ‘best out of 3’ in a physical store meant that our pair of the adios 3 ended up having no issues, allowing a fair like-to-like comparison with the 2014 adios 2. The basic design template has changed a lot since the adios 2. The 2016 model uses a thin, well ventilated spacer mesh with synthetic suede for company. The adios uses a high end material called Tirrenina suede, a substrate which mimics the properties of natural suede, but without the baggage of color bleeding and excessive moisture retention. The toe-bumper and forefoot design is fairly simple, using synthetic Suede and breathable mesh. That small strip is reflective. No low-light visibility on the logo stripes this year. There’s suede around the toe-bumper and eye stay area, and the three stripes logo and heel wrap are made of regular synthetic. There is some evidence of cost cutting; previously, the side logo used to be made of this premium suede lined with reflective embedding. Reflectivity is reduced on the adios 3. Reflectivity is cut down on other areas as well. The toe-bumper and heel now sport only a thin strip instead of the liberally applied dots of the adios 2. Despite lacking in cosmetic niceties, there are fit improvements on the adios 3. The forefoot feels less cramped, and the top-down lacing pressure goes easier. There are a few factors resulting in this difference, and we’ll lay it out for you. 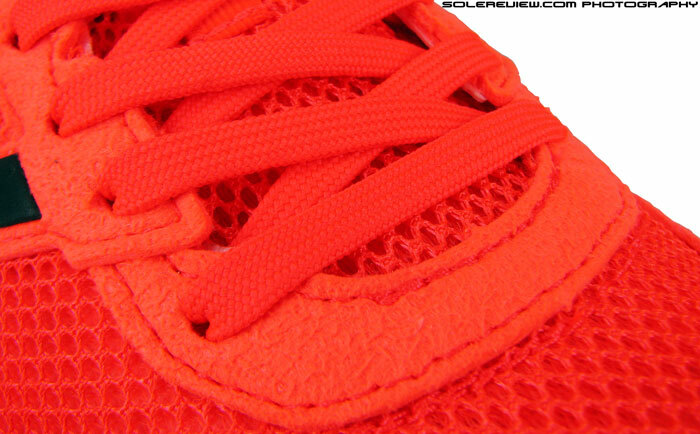 1) Lacing is pushed back rearwards by 5 mm 2) Longer tongue with a rubberized logo 3) Same heel fit. 1) Taller toe-bumper 2) Better spread of midfoot fit due to lacing density 3) Heel reflectivity removed – most of it, that is. 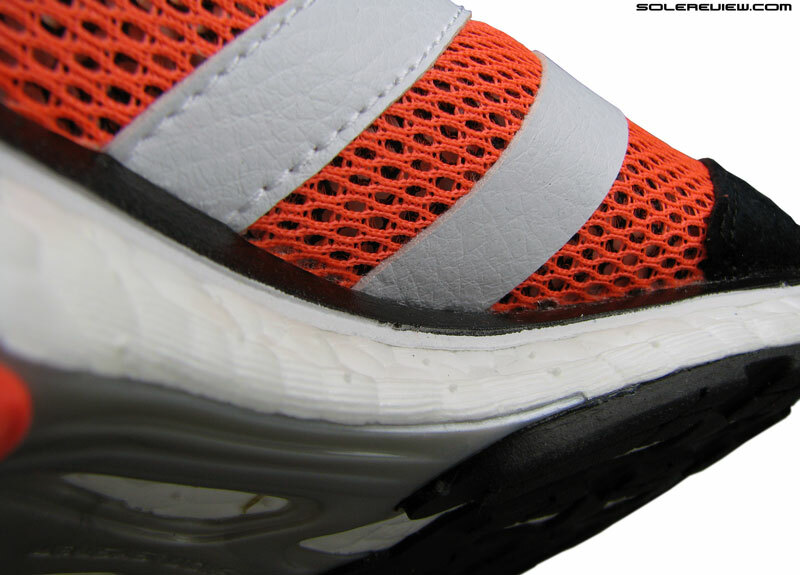 The adios 3 lacing starts further away (5 mm) from the toe-box compared to the adios 2, and that relaxes the forefoot fit. 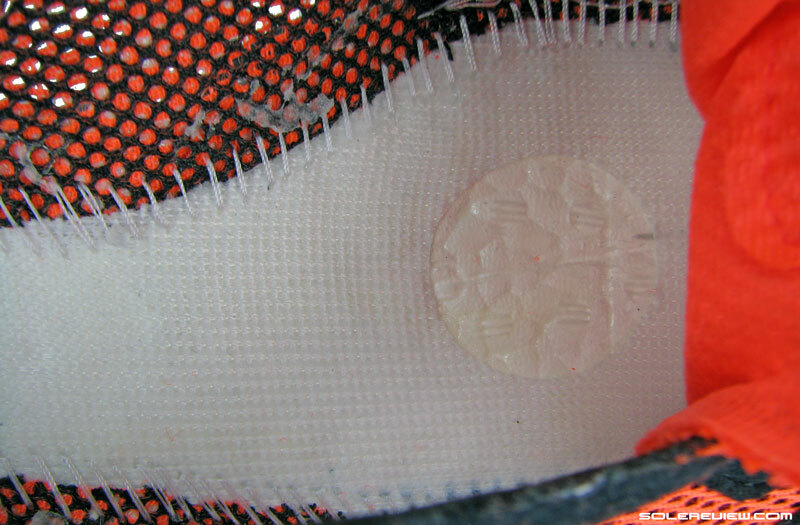 The other significant update happens around the way the lacing eye-stay is designed over the forefoot. The synthetic suede component is made wider over the forefoot (see images comparing the top-view), so there’s less material concentrated in one place. This improves the upper flexing behavior, as the adios 3’s front is less prone to pressing inwards on the forefoot – the redesigned u-throat splays outwards over a larger area. In comparison, flexing the adios 2 led to the sensation of excess upper material present over the forefoot. Since both the adios 2 and 3 have the same number of lacing rows, the lacing moving backwards on the adios 3 means that the rows are now spaced closer. This helps better the quality of top-down midfoot fit. 1) More forefoot room because of lacing moving backwards 2) Logos are non-reflective, and the eyestay is a single piece component now 3) Softer heel cushioning. The eye-stay also happens to be single piece, compared to the adios 2 design which had a seamed joint in the front. adidas had to join it because of how the 3 stripes logo extended downwards as a part of the lacing area. This construction technique had the goal of achieving better cutting efficiency of individual upper components during production. 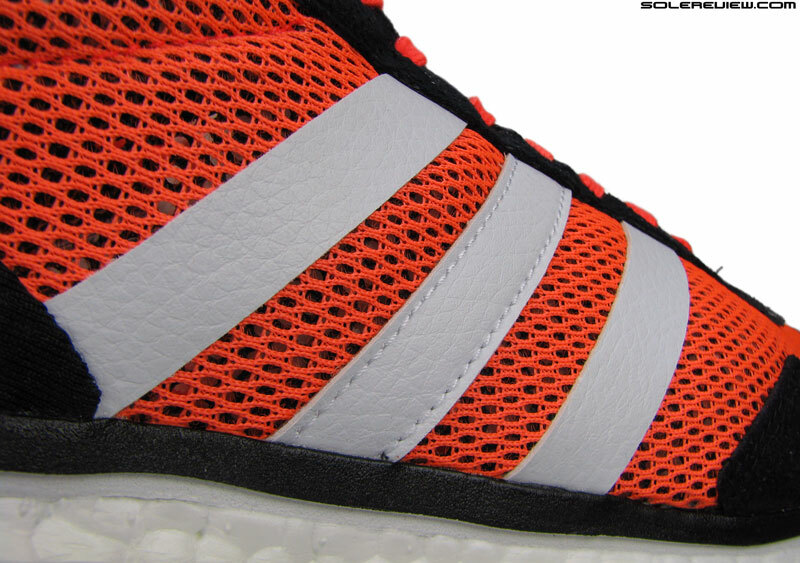 If the adios 2’s eye-stay and three stripes was a single large component, then there would have been a lot of cutting wastage. Read more about component nesting here and here. By separating the eye-stay and the logo stripes on the adios 3, adidas can afford to deliver a single piece eyestay and still achieve production efficiency. Same tongue design as the adios 2, except longer. The deconstructed quality of the tongue design leads to the edges curling inwards. The interiors aren’t best suited for sock-less running. 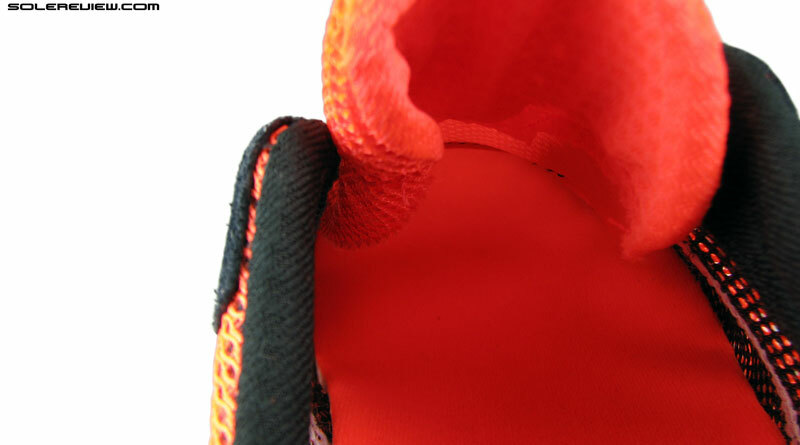 The flatlock seam does not irritate, but you’re better off running in socks. Lacing pressure is better insulated by the adios 3’s tongue flap, which not only happens to be longer but also has an urethane logo box which filters the lacing pressure better. Both these factors also contribute to making the top-down fit quality better. The only thing which hasn’t changed is how the shoe feels when worn barefoot. The raw edges of the tongue still feel scratchy, making the adios a not-so-ideal shoe for barefoot running. Same heel fit as the adios 2, no changes here. Heel fit is identical to the adios 2. The back has an internal counter, and the mesh and foam package is of a familiar make. To sum it up, it won’t be wrong to say that the adios 3’s upper is a better fitting version than the adios 2. That is, if you get a properly finished and fitting one, apropos adidas’s hit-or-miss manufacturing quality. We’re split on which adios version is better. On one hand, one misses the firmer ride of the adios 2 which rewarded midsole responsiveness with pace, and that grippy front-end which worked like magic on synthetic tracks. The adios 3 is comparatively tamer to ride in with its softer quality but has an evenly spread forefoot plant. 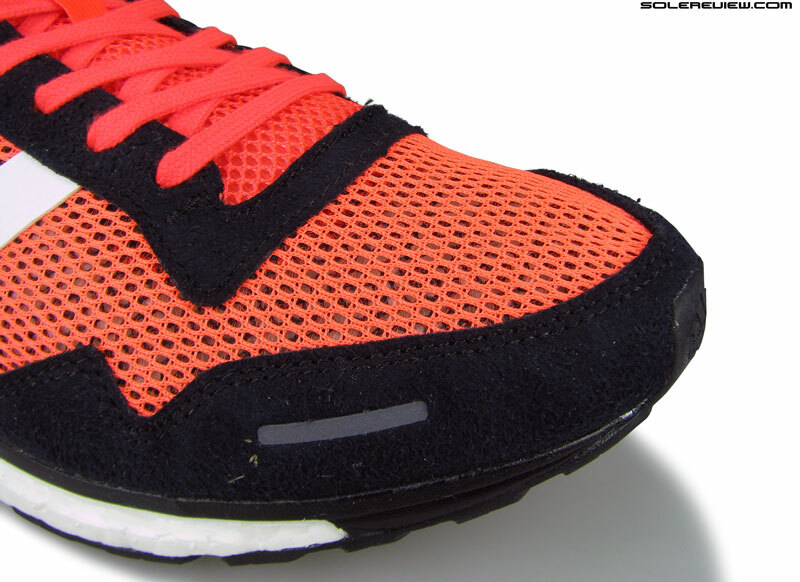 There’s an upside in cushioning softness, but at the cost of outsole durability. But then, the 3 has a better upper fit. So the mixed factors makes it hard to decide, doesn’t it? We say that you get the adios 3 if the cramped adios 2 forefoot and lumpy front outsole was a dealbreaker. Otherwise, adios 2 was, and is still a great shoe for those quick runs. Looking to upgrade your older adidas adios 2 to the latest version, but not sure how the 2016 model compares? We can help here. The following infographic is a ready-reckoner for what changes you might expect in the new model vs. old. To make this more fun, we’ve put in a system of percentage match, which calculates a weighted average for a set of attributes.